Rohit Sharma will lead Mumbai Indians out in their first game of IPL 2019 at the Wankhede Stadium on Sunday against Delhi Capitals. 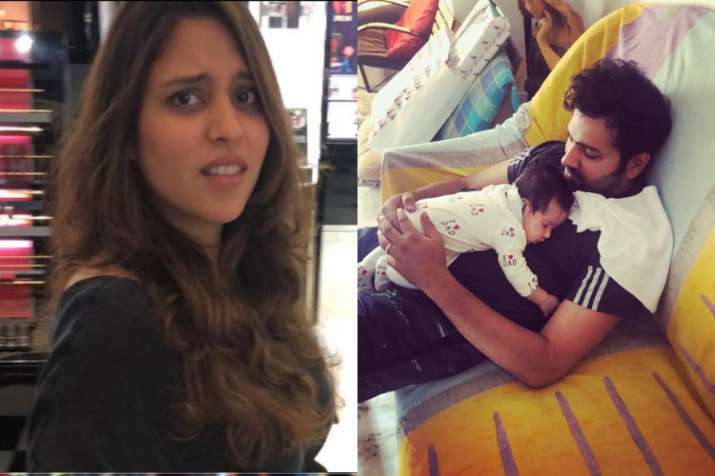 Rohit's wife Ritika Sajdeh posted a video on Instagram on Saturday, where Rohit was seen playing with his daughter and humming the lyrics of 'Asli Hip Hop' from the Ranveer Singh-Alia Bhatt starer hit movie 'Gully Boy'. While Samaira was all into it and having a good time with papa, Ritika was not impressed with the choice of song from the MI captain. Rohit and his daughter are very close and often can be seen sharing pictures with his daughter. He had Ritika tied the knot on 13 December, 2015 and Ritika gave birth to their daughter on December 31, 2018. While this is a happy moment for the family, Rohit's main focus now would be delivering MI their fourth title. The Mumbai franchise will be playing their first match against Delhi Capitals on March 24 at the Wankhede Stadium. Earlier, Rohit revealed his batting position and said that he will be opening the batting in this IPL. Rohit, who came at No.4 mostly last season, thus, allowing Evin Lewis and Suryakumar Yadav to bat at the top, said that the decision was taken keeping in mind the 2019 World Cup and his familiarity with the position. "In the past, I have batted in the middle-order and opened also in a few games. This year I will open the batting in all the games, that's for sure," said Rohit ahead of MI's season opener in Mumbai on March 24. "Yes, the World Cup is one of the factors, but also while keeping in mind that this is where I bat for India and that's where I have got a lot of my success of late," he added.